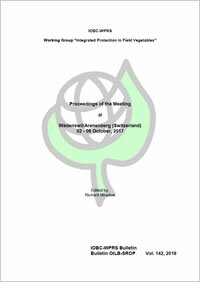 IOBC-WPRS WG Newsletter Sting, WG "Integrated Control In Protected Crops, Temperate Climate"
IOBC-WPRS Publications 1968-2010. Compiled by Horst Bathon. BioControl is the official journal of the International Organization for Biological Control (IOBC) and presents original papers on basic and applied research in all aspects of biological control of invertebrate, vertebrate and weed pests, and plant diseases. Over the years, it has established a leading role in publishing the finest and most exciting work on all aspects of biological control of invertebrate, vertebrate and weed pests, and plant diseases. Coverage includes biology and ecology of organisms for biological control, and aspects of use including biological controls for integrated pest management, such as plant resistance, pheromones and intercropping. Papers presenting only laboratory trials on non-target effects of pesticides on natural enemies are not considered but papers dealing with the corresponding effects on community dynamics of natural enemies are welcomed. IOBC-WPRS individual and supporting members can subscribe to BioControl at substantially reduced cost. Institutional members have the subscription included in their membership fee. Readership: Your article will be available on SpringerLink which has over 50 million users at more than 15,000 institutions worldwide. In addition, you will be able to see the number of times your paper is being downloaded, its citations and social media shares. SharedIt: A read-only version of your article will be freely available to anybody you choose! Cambridge University Press, New York, 380 pp. The IOBC-WPRS Bulletins are a well established series of relatively fast issued working papers in a systematic format. Bulletins are proceedings of Working and Study Group meetings and Commission activities. The number of volumes varies each year (10-15 volumes). This publication is an important support to the Working Groups of WPRS. IOBC-WPRS publications are available (as eletronic documents) in the Online Shop. The complete manuscript for a proceeding "Bulletin" has to by submitted to the technical editor within 6 month after the meeting. IOBC-WPRS news are published in a Newsletter sent by e-mail. Subscribe to get the next issue. The publication of this Newsletter of IOBC-WPRS was discontinued in 2010 and replaced by the e-mail Newsletter and announcements posted in the News section of the web site as well as on the IOBC-WPRS Facebook and Twitter channels. The IOBC-WPRS newsletter, PROFILE, was first released in January 1984. For 26 years PROFILE provided information about the activities of Working and Study Groups, meetings, news from the Council, information from IOBC-Global, etc. Over that time PROFILE was served by three excellent editors: Ernst Boller (1984-1987), followed by Albert Minks (1988-1996), and finally by Horst Bathon (1997-2009). All three editors contributed tremendously to compiling and spreading news and information about wprs through the printed version of PROFILE, as this was the only channel before the internet website. PROFILE first appeared as a PDF on the IOBC-WPRS website in 2003, and past issues can be found under Publications. 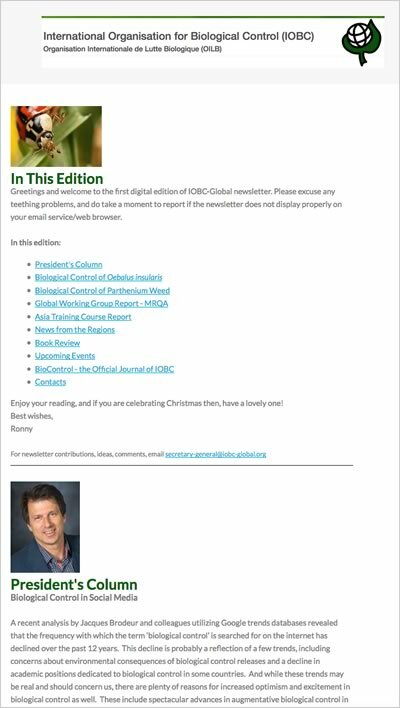 For the past few years the IOBC-WPRS website, with its continual updates, has served as the forum for dissemination of most information formerly covered by PROFILE; therefore, the newsletter will no longer be produced. This decision was taken at the General Assembly in Ocotber 2009. The Council appreciates all efforts of everyone that provided information to PROFILE over the years and expresses its deep gratitude to the three editors for years of dedication and service. Integrated Pest Management - Design and application of feasible and effective strategies. Edited by F.G Wijnands, R. Baur, C. Malavolta, & B. Gerowitt (2012). Integrated Pest Management: The way forward to sustainable agricultural production. Conference on reducing pesticide dependency, commemorating the 50 th anniversary of Rachel Carson's "Silent spring", 19 June 2012, Brussels, Price: € 25,00. ISBN 978-92-9067-244-9, Price: € 25,00. Classical and augmentative biological control against diseases and pests: critical status analysis and review of factors influencing their success. Ecological Infrastructures: Ideabook on Functional Biodiversity at the Farm Level Temperate Zones of Europe. Boller, E.F., Häni, F. & Poehling, H.-M. (eds. ), 2004. 220 pp. Download: Preview (pdf), Flyer (pdf). A Manual for Research on Verticillium chlamydosporium, a Potential Biological Control Agent for Root-Knot Nematodes. Kerry B.R. & Bourne J.M. (eds.). 2002. XIII + 84 pp., 14 fig., 4 fig. in colour, Gent, IOBC-WPRS, ISBN 92-9067-138-2, Price: € 15,00. For further information see announcement with preface and table of contents: Announcement (pdf). You may order the book by letter, fax or e-mail from: Dr. Annette Herz. Guidelines to evaluate side-effects of plant protection products to non-target arthropods. Candolfi M.P., Blümel S., Forster R. et al. (eds. ), 2000. IX + 158 pp., Gent, IOBC-WPRS, ISBN: 92-9067-129-7, Price: € 25,00. Monitoring Populations of the Carrot Fly Psila rosae. Finch S., Freuler J. & Collier R.H. (eds. ), 1999. VIII + 108 pp., 27 Figures, 28 Tables. Dijon, IOBC-WPRS, ISBN 92-9067-110-6, Price: € 10,00. This book contains 9 sections discussing the monitoring activities and strategies for monitoring of the carrot fly, P. rosae. Specific topics include fly behaviour and biology, trap characteristics, trap selectivity, trap location, and repellents and attractants. You may order the brochure by letter, fax or e-mail from: Dr. Annette Herz. The Use and Regulation of Microbial Pesticides in Representative Jurisdictions Worldwide. Kabaluk, J. Todd, Antonet M. Svircev, Mark. S. Goettel, and Stephanie G. Woo (eds.). 2010. IOBC Global. 99pp. Quality Control and Production of Biological Control Agents: Theory and Testing Procedures. J.C. van Lenteren (ed. ), 2004. 327 pp. This book was written by many IOBC members and is the result of work done in global and wprs working groups on quality control of natural enemies. The use of biological control agents has been increasing worldwide and there are now many companies massproducing such organisms, particularly for the control of insect pests. However, there is a great need for quality control in the production and use of these natural enemies, which include insect parasitoids and predators, fungi and viruses. This book has been written by leading scientists to provide both background theory and practical guidance on this subject. ISBN 0 85199 688 4, US $ 120.00, www.cabi-publishing.org/bookshop. Some copies still available for reduced price at Joop.vanLenteren@wur.nl. International Organization for Biological Control of Noxious Animals and Plants: History of the First 50 Years (1956-2006). The International Organisation for Biological Control (IOBC) celebrates its 50th anniversary. What started in 1956 with the first meeting of European pioneers in biological control evolved into an independent organisation with world-wide activities (www.iobc-global.org). IOBC’s expertise covers now all aspects of sustainable crop protection in major annual and perennial crops. To commemorate this milestone, a book on the colourful history of this organisation has been published.